2015 saw Manchester Airport crowned as the best airport in the UK, beating Heathrow and Gatwick and the site’s been in use since the 1960s. The peak in passenger numbers came as a result of the addition of new international routes, as well as the announcement of £1 billion investment in the airport. With the rapid growth expected at Manchester Airport, it is understandable that nearby residents will have some concerns about the impact it will have on the surrounding area. To combat this, the airport operates a successful noise complaints policy, and does everything it can to ensure minimal noise and pollution problems locally. For a full list of airport contacts, see our airport contacts page. While aircraft flight paths might have a negative effect on house prices in the area, living so close to a major airport may be a positive thing for frequent flyers, or those working in the aviation industry. No matter how close you are to the airport, it can affect you. Having an airport as a neighbour can be great: they often have great public transport links and taxi firms, provide jobs at the airport and with local hotels and attractions. On the flip side, residents may experience issues with air and road traffic, tourists and noise disturbances. 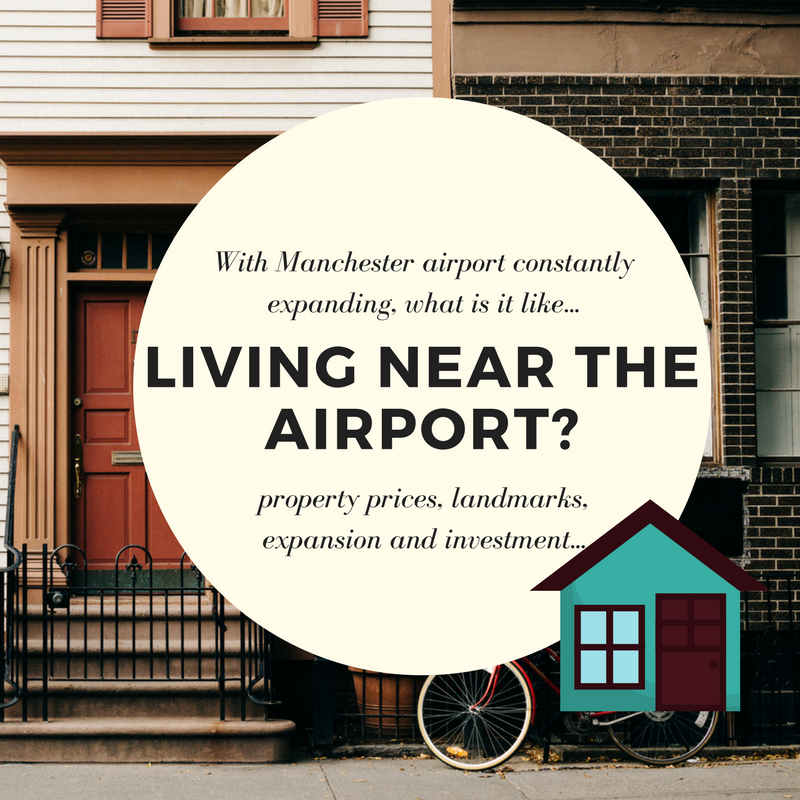 Here’s a guide to the local postcodes around the airport with links to Our Property to help explain what it’s like living close to Manchester Airport. Manchester M12 O2 Apollo Manchester – great for big gigs, concerts and national events. Manchester M13 University of Manchester – created in 2004 by joining Victoria University, Manchester and the Manchester Institue of Science and Technology. It now accepts around 40,000 students. Manchester M14 Platt Fields Park – First opened in 1910, it’s one of Manchester’s biggest open spaces. Great for dog walks and picnics. Manchester M16 Old Trafford Football Stadium – this is the playing ground of Manchester United FC, a must see for any football fan. Manchester M18 East of the city, M18 is home to Gorton Cemetery and the Wright Robinson College. Manchester M19 Around 4 miles out of the city centre, and is home to the villages of Burnage and Levenshulme, bordering on Parrs Wood. Manchester M20 Didsbury Sports Ground – self-proclaimed ‘hidden gem’ in the heart of the Didsbury Heritage Zone. Good for amazing views, venue for events and sports competitions. Manchester M21 Chorlton Nature Reserve – great natural habitat next to Sale Water Park. Manchester M22 This postcode neighbours the airport itself. It’s home to Northenden Golf Club. Manchester M23 From the Mersey River to Davenport Green in the south, the M23 postcode takes in Wythenshawe Park and Hospital as well as Roundthorn Business Park. Manchester M31 This postcode hosts Carrington Business Park, so if you’re travelling for business in Manchester, it’s one to check out. Manchester M32 Largely residential area to the south west of Old Trafford. It takes in Stretford, Stretford Meadows and Turn Moss Playing Fields. Sale M33 Another largely residential postcode which has enveloped the area of Sale. Manchester M34 Audenshaw Reservoir, constructed between 1877 and 1882 and they’re still a great place to visit today. Manchester M41 M41 is a residential area engulfing an island of intu Trafford Shopping Centre and includes the Davyhulme Park Golf Club. Manchester M44 Mainly a residential area, bordering on the airport, it’s hidden gem is Prince’s Park, Irlam. Manchester M90 M90 is the postcode for the airport itself. Stockport SK1 Stockport Market Place – historical place of trade that’s still active today. Macclesfield SK10 This postcode is home to Adlington Hall and Gardens, an incredible private house with connections to William the Conqueror. It is also home to Bollington Arts Centre, Clarenence and Adelphi Mills. Macclesfield SK11 Jodrell Bank Observatory – Part of Astrophysics at Manchester University and 2017 marked their 60th Anniversary! SK11 also holds Macclesfield Castle and the main Macclesfield train station. Stockport SK12 Lyme Park – Now owned by the National Trust, you might recognise is as ‘Pemberley Hall’ in the TV version of Pride and Prejudice. Stockport SK2 Goyt Mill – Historical Mill on the canal, now a Saddlery Shop. Stockport SK3 SK3 is home to the historical St Peter’s Church in Heavily as well as the more modern Edgeley Park Stadium near Mercian Way. Stockport SK4 The Stockport Viaduct runs through this area, really you can’t miss it! Stockport SK5 Reddish Vale Country Park – 161 hectares in the heart of Stockport. Great for family walks, cycling and bird watching. Stockport SK6 Home to Pear Mill Industrial Estate, the Roman Lakes and Top Lock, Marple. Stockport SK7 Bramall Hall – Local heritage site. Dating back to the Middle Ages, it’s a Tudor Manor house with landscaped gardens. Cheadle SK8 Bruntwood Park – local landmark for parklands, woodlands with Victorian style sports and a conservatory restaurant. Wilmslow SK9 Quarry Bank Mill – A National Trust Property with loads of themed events and information evenings for the whole family. Lymm WA13 Lymm Cross – Grade I place of interest built in the 17th Century. Altrincham WA14 As a local, you’ve probably visited Dunham Massey Hall on school trips and with the family. A gem in Altrincham, it’s owned today by the National Trust. Altrincham WA15 Frank Sidebottom Statue, a tribute to the original iconoclast. This postcode is also a northern neighbour of Manchester Airport itself. Knutsford WA16 Tatton Park – Great place for local history and for booking your private event.